Almost two years later, lots of back and forth with what my email address and password are, I'm back because of Chris. He doesn't like looking at my left nostril anymore, although I can't understand why not. It's lovely and deformed. Anyway, here is something far more fun to look at. 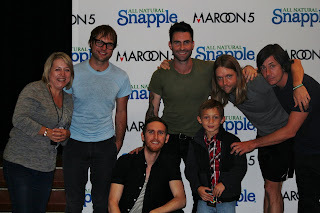 It's me and Ned with Maroon 5, we snuck in because we're cool like that! I will try to be here just for you Chris, but I never seem to have any damn time to do anything anymore!! But at least you don't have to look at my nose now. Christy Brown can have his Left Foot, I have my Left Nostril! Seriously, what is up with my left nostril being tiny compared to the other one? So today I woke up with a big fat lip that was caused by a spot on my lip. A spot. A spot turned half my mouth into half of Angelina Jolie's mouth. 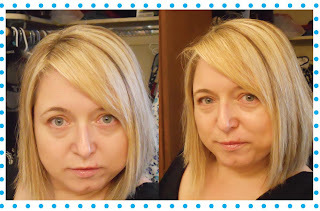 Who the hell would want to get collagen injections when it makes you look deformed like this? Anyway, I took this picture to document my swollen lip and as I looked at it I thought, "holy crap, what is up with my left nostril?!" Now I feel slightly deformed and think that it may have caused a disadvantage in my life. I don't know what but I want you all to feel sorry for me and not laugh at me and my deformed nostril. The spot appeared above my lip (it is not a cold sore) on Thursday. I believe this was a stress spot because I had just crashed my car after skidding on a sheet of ice. Why anyone wants to put a sheet of ice on the damn streets is beyond me, but this is what I slid on. And caused nearly $2,000 of damage to my car from crashing into the curb. Yes yes, I know, thank God Ned and I were not hurt, thank God we didn't hit anyone else. But seriously! $2,000? And I have to pay the first $500 for my deductible. So I guess I was sort of stressed out. And the spot appeared. And yesterday it got worse. So, I may or may not have tried to squeeze it as hard as I possibly could, and this may or may not have caused the swelling. Whatever, I am not liable for anything! The only good thing that happened is that today I got all my hair chopped off and love it, although I am not loving the big scabby spot above my lip! About a year and a half ago when I resided on a different blog, some chicky posts a comment on my blog and says "hey, I live in Nevada too, we should be friends!". I am thinking, girlfriend, I am never going to meet you, you live in Vegas, I live in Reno, we are an 8 hour drive from each other. So, I get this email from Shelly last year saying that her husband is coming up to the air races and she is going to come with him and see me. Um, okay, I think! What do I know about this person, except for she sometimes posts on a blog called Seriously, Shelly, and she likes to drink? Oh, she likes to drink, who cares if she is an axe wielding lunatic who will stalk me forever! She drinks!!!! That was my first visit from Shelly. Before Christmas I got another email saying, hey, I'm coming up to see you because I have a free air ticket! Hmm, more drinking me thinks! Shelly arrived on Saturday and we had a great weekend, that was full of pasta, wine, martinis, Thai food, drinks at a bar with guys we have never met, going to bed on time (I love you Shelly for not making me stay up past my bed time! 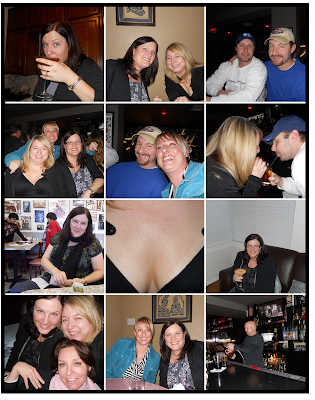 ), taking cleavage photos, eating Sunday breakfast at Mel's Diner at noon, shopping at Target, good food, more martinis, laughing at the Golden Globes. Yes, I am in love with Shelly! We had a blast and it was so much fun! Next on the list is a trip to Tahoe with Shelly and Christy (girl, where is your blog for I have lost it!) because I don't have the money to go visit Christy in New Hampshire! And now, I must detox for the next four weeks to get my liver functioning again! Why is this man who proclaims to be a Christian such a horrible, horrible person? Why is he so judgmental over others when the Bible teaches us not to judge anyone? 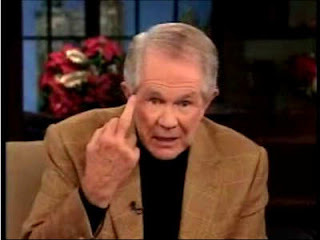 There is only one judge and thank the Lord it is not Pat Robertson! On the January 13, 2010 broadcast of The 700 Club, Robertson blamed Haiti's 1791 slave rebellion and the vodou origins of the Haitian Revolution for the Haitian Earthquake of January 12, 2010, telling viewers of his Christian Broadcasting Network, "[S]omething happened a long time ago in Haiti, and people might not want to talk about it, they were under the heel of the French, uh, you know, Napoleon the third and whatever, and they got together and swore a pact to the devil, they said, we will serve you, if you get us free from the French, true story. And so the devil said, 'OK, it's a deal.' And they kicked the French out, the Haitians revolted and got themselves free, and ever since they have been cursed by one thing after the other, desperately poor." Thankfully our President does not agree and is willing to send all the help necessary to assist with this awful tragedy. And anyone who says that Scotland is a dark land overrun by homosexuals has never got it on with a hunky Scottish man! Or, maybe he has.......!!! I quietly decided a few weeks ago that I am not interested in finding a man to share my life with. The main reason for this is I quite like my life just the way it is and I am not prepared to change it for anyone. Selfish, I know, but it is just the way I feel right now. I will probably change my mind in 6 months when the winter has gone and I have hopefully shed a few pounds but for now, I am happy with my day to day routine and I do not want to have to take anyone else into consideration other than Ned and myself. Loser: wanna get high with me? Loser: wanna get loaded honey? Me: dude, you are weird. don't you think there are better ways to get my attention? Me: Are you on Reno's Most Wanted list? Are you a stalker? I have a friend who is a US Marshall you know, I can find this stuff out. Um, to get stoned even more? To stalk some girl that you have been harassing for the past 6 months? I think I will pass thanks. He then sends me a message telling me that he is quite safe, he is only a bmx biker who is 5'3". Seriously, how could I date a guy who is only 1 inch taller than me and therefore qualifies as official hobbit height and is a bmx biker? How the hell would he pick me up for a date on his bmx bike? 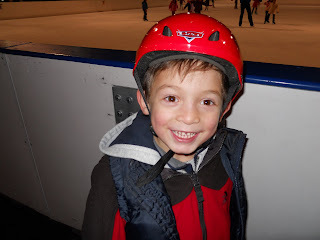 Ned thinks that after two trips to the ice rink, he knows how to skate. Ned says he is not going for skating lessons. Ned kicks and screams and is on the verge of a tantrum. Ned's mom screams back "You do not know everything, I have paid for these lessons and you are going damn it, and you are going to like it!" Ned shrugs his shoulders and says "okay", like it's no big deal. Ned's mom wants to strangle Ned but she resists and instead, takes him to his ice skating lesson. After a deer in the headlight look of panic as he stepped out onto the ice without me holding his hand, he took a deep breath and went for it. He listened to the instructor. He skated forward. He skated backward. He even learned how to stop. I love my little ice skating Ned!